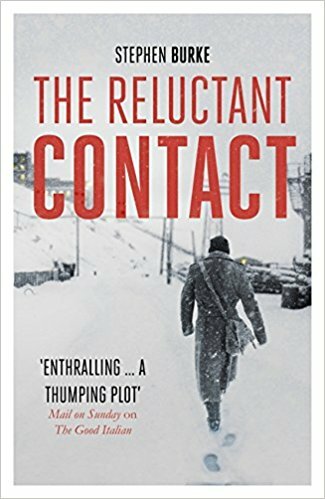 Stephen Burke’s new novel The Reluctant Contact is set in Svalbard in 1977, Norwegian territory, yet closer to the North Pole. Russian engineer Yuri arrives on the last boat to the Soviet mining outpost of Pyramiden, as the Artic sun disappears for the winter. Yuri still plays by Stalin-era rules: Don’t trust anyone; keep your head down; look after number one. Yet when a co-worker is found dead deep in the mine, the circumstances appear strange. At the same time, he begins a stormy love affair with the volatile, brooding Anya. She has come to Pyramiden to meet someone who has not shown himself in three months, if he exists at all. While the whole island is frozen in twenty-four-hour darkness, and cut off from the outside world, Yuri enters a dangerous world of secrets and conflicting agendas, where even the people closest to you are not always what they seem. Burke throws his characters into an isolated world where there is nowhere to hide and is a perfect backdrop for his protagonist Yuri to immerse himself into the murky terrain of informing and spying. The story is told from the point of view of Yuri and Burke has given this unlikely hero a lot to deal with. You get a good sense of the isolation and seclusion the never-ending blackness of winter in the Artic has to offer, and adds to the tension that Yuri and his lover Anya feel as the plot thickens and the pace moves up a gear. If you are a fan of spy novels, then The Reluctant Contact is a must read. It sweeps you along as the plot makes for compulsive reading, leaving you guessing till the very end. Thrilling to the very last page, Burke has set the bar high in this his second novel; his debut novel The Good Italian was shortlisted for the HWA Debut Crown award and it is easy to see why.